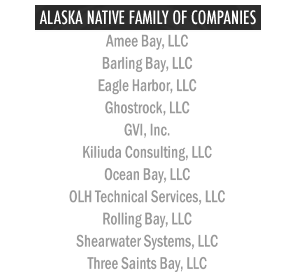 Amee Bay, LLC is a Marine Engineering Firm that is an Alaska Native Corporation (ANC)-owned, Small Disadvantaged Business (SDB), Minority Business Enterprise (MBE), 8(a) Program graduate. We are a subsidiary of Three Saints Bay, LLC, which is owned by Old Harbor Native Corporation. We have offices in Charleston, SC; Anchorage, AK; Manassas, VA; Chesapeake, VA; Jacksonville, FL; San Diego, CA; and Philadelphia, PA.